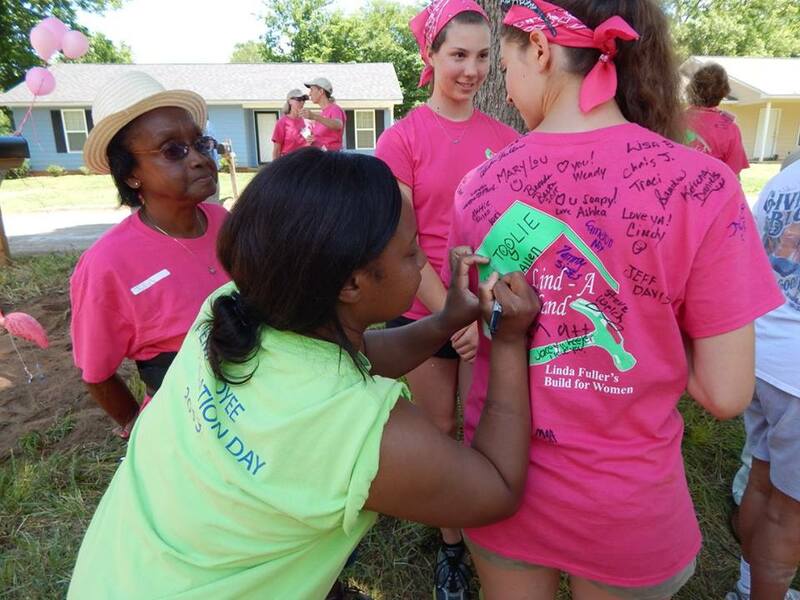 The first day of June saw the start of the Lind-A Hand Build — Linda Fuller’s Build for Women — in Lanett, Alabama, hometown of Fuller Center founder Millard Fuller. I was there that day, and it was obvious from the start that this would be a June to remember. The ladies there ran ahead of schedule all week and did a fantastic job. The event culminated with an emotional dedication ceremony that Friday, something you can learn more about by checking out this link summarizing the week and then watch this video from the build. Our 4,000-mile Fuller Center Bicycle Adventure got under way in California and has now reached the mountains of Colorado on their way to Maine. Here’s a story story from KESQ-TV about the Adventure’s first build day and here’s a story from The Cortez Journal newspaper about the ride. We’ve launched a mobile-friendly version of our website as more and more people are now using mobile devices. We got a note and photos from our partners in Pignon, Haiti, a relatively new site for us in the country, thanking you for making their work possible. Check it out! Our partners in another new site — Bolivia — are now taking Global Builders team and have launched their own Facebook page. Speaking of Facebook pages, our own is about to hit 9,000 likes! As I’m writing this blog, it stands at 8,998, so it’ll probably have crossed that mark by the time you read this. Fuller Center President David Snell is on a tour of U.S. Covenant partners and so far has made stops in Greenwood, Mississippi, and Harrison, Arkansas. We’ll be adding to this photo album as he goes along. Bart Tucker discussed August’s "Back to Biloxi" build in this article, which also introduces us to one of their partner families for the build. The "Back to Biloxi" build is just one a few 10th anniversary builds going on this year, as you can learn about in this report. WLKY-TV has this great story about how The Fuller Center in Louisville is partnering with a church to improve the neighborhood surrounding it. We’ve got another wonderful milestone to report — Armenia has dedicated its 400th home! And another milestone as Sri Lanka dedicated its 100th home! WTHR-TV has this story about how Allison Transmission has teamed up with The Fuller Center once again to build a third home in Speedway, Indiana. Youth group members and leaders from Alpharetta (Georgia) Presbyterian Church discuss why they’ve put faith into action by working with The Fuller Center in this new video. The Hammond Daily Star has a great article about the Ginger Ford Northshore Fuller Center’s latest new home build in Independence, Louisiana. You don’t have to swing a hammer to help make a house a home as you’ll learn in this Shreveport Times article about a young artist’s support of our work there. Midway Baptist Church sent back some great photos from their Global Builders trip to Haiti. Here’s a fun little tidbit — Eastern University is using our Director of International Field Operations Ryan Iafigliola in advertisements like this to tout one of their master’s programs. We had a wonderful group of Coptic Christians from Long Island, N.Y., working for a week in Americus. Check out the photos! On June 3, ProPublica and NPR published an extensive article titled "How the Red Cross Raised Half a Billion Dollars for Haiti and Built Six Homes." It’s worth noting that the six homes were actually built by The Fuller Center with a $48,000 grant from the Red Cross. We stand ready to put more of their funds to work building permanent homes. We’ve built more than 175 in Haiti so far, and this presentation explains why we set the standard for building in Haiti. That’s a sampling of what’s been going on in the past month, and, quite frankly, my fingertips are tired from pounding this keyboard. Help us make my fingers even more tired when I give my report for July!